Beaches and Bays chose its name because of the many “beaches and bays” in and around the beachside suburb of Bloubergrant which borders the areas of Sunset Beach, Table View Beach ( nicknamed Kite Beach ), Big Bay and Bloubergstrand, Cape, on the West Coast. There are many more “beaches and bays” close by. We are situated 1km from our local “beaches and bays” where one can see the world famous views of TABLE MOUNTAIN and ROBBEN EILAND.
" home of your friendly hosts "
Come and join the many tourists and local residents alike who can be seen on the beaches either soaking up the sun, taking leisurely walks on the beach or the promenade or sitting having a relaxing meal or sundowner in one of the many pubs and restaurants along the beachfront or just sit and gaze or take photographs of our world famous views from across the “bay”. 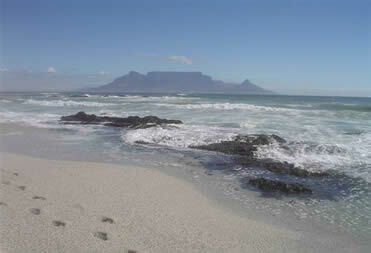 There are many “beaches and bays”, in and around our suburb of BLOUBERGRANT. There also beachside supermarkets and mini malls as well as larger shopping malls, health clubs, banks, a cinema complex, yacht club, golf courses, wetland nature reserve and bird sanctuary, doctors and dentists rooms as well as hospitals and a medical clinic. Colourful kite surfing sails that fill the skyline when these activities are taking place is a beautiful site to see. 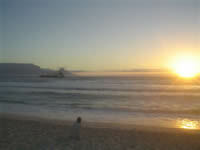 We are only +-20min car drive from Cape Town and the Victoria and Alfred Waterfront. A short car drive or walk from these two venues will take you to the Green Point Stadium where some of the 2010 World Cup Soccer matches were played.